Strong economic and profit growth on the heels of tax reform have led US equity markets to outperform their international counterparts so far in 2018. 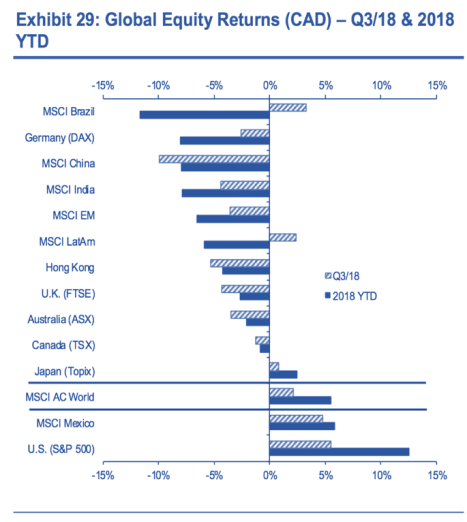 After strong returns in 2017, and a solid start to the year, international equities have disappointed investors over the past few months. The bond market has found itself under pressure for most of 2018, as stronger economic growth has led many central banks to start to tighten monetary policy for the first time since the financial crisis. Meanwhile, oil posted the longest string of quarterly gains in more than a decade. The MSCI AC World index delivered a 3.8% (USD) gain in Q3/18, as investors looked past escalating trade tensions. However, index performance was distorted by the US, where the S&P 500 scored an impressive +7.2% gain. Excluding the US, the global benchmark delivered a much less inspiring performance (+0.0%). In the DM space, Europe (+0.4%) and Pacific (+1.4%, Japan +3.0%) regions managed to gain some grounds. In Canada, the TSX Composite barely ended Q3/18 in positive territory in USD terms (+0.3%) but slipped 1.3% in local currency. EM equities suffered a 2.0% drop in Q3/18, pulled lower by EM Asia (-2.7%) as both China (-8.4%) and India (-2.8%) declined. Latin American equities posted a 4.0% gain last quarter. 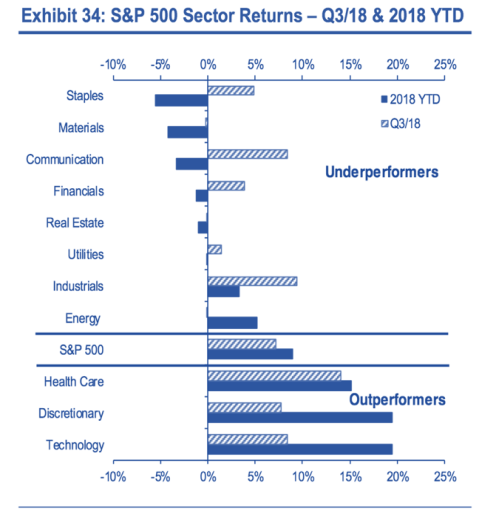 Eight S&P 500 sectors gained ground last quarter, with Health Care (+14%), Industrials (+9.5%), Communication/Telecoms (+8.4%), and Technology (+8.5%) posting the strongest returns and outperforming the S&P 500. Real Estate (+0.0%), Utilities (+1.5%), Materials (-0.1%), and Energy (-0.1%) were the weakest performers. Leadership was again a mix of cyclicals and interest sensitive sectors. 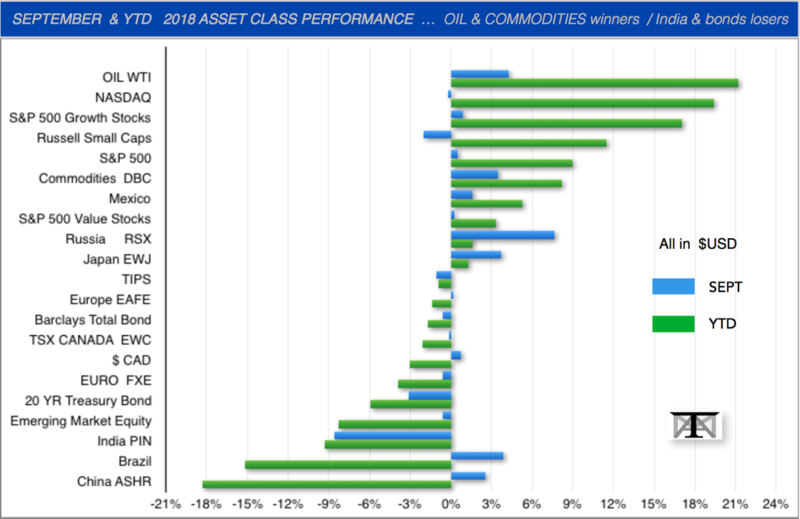 YTD, narrow leadership leaves only Discretionary, Technology, and Healthcare as outperforming the S&P 500. Health Care stole the show with an outstanding performance. 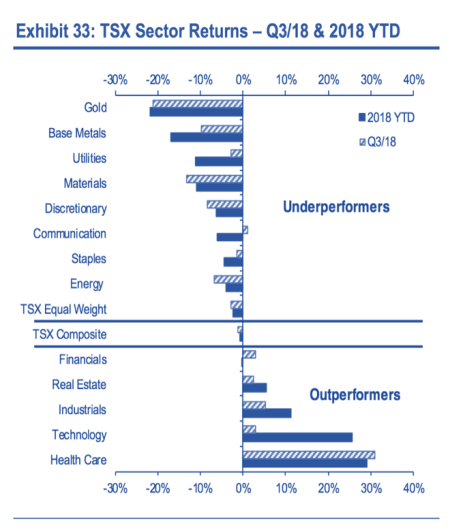 Technology, Industrials, Real Estate, and Financials also managed to outperform the TSX last quarter. 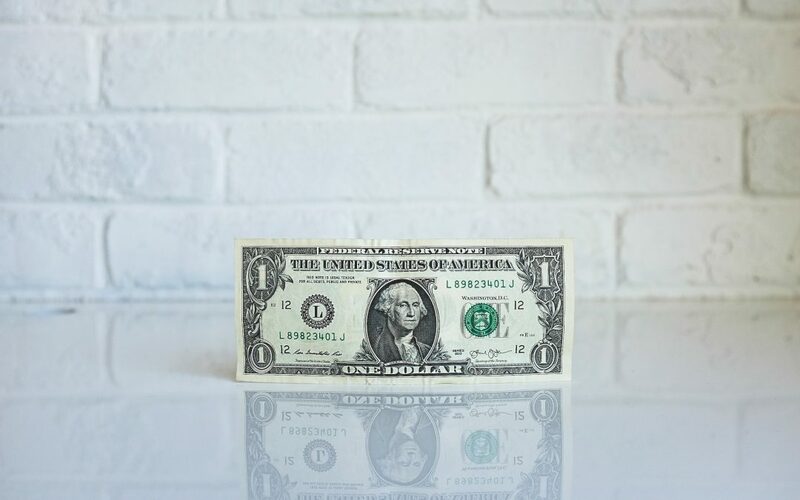 The USD strength was visible in Q3, with the DXY index rising 0.7%. Still, the Canadian dollar and Mexican peso managed to recover some ground against the greenback, appreciating 1.7% and 6.4%, respectively. While the euro and the yen were a tad weaker relative to the USD in Q3, the Brazilian real was the weakest performer, falling 4.3% and hitting a new 52-week low (BRL-USD). The CRB index slipped 4.3% in Q3/18, with WTI (-1.2%), copper (-4.9%), gold (-4.8%) and silver (-8.8%) all retreating. Two notable exceptions: Brent prices moved up 4.1% and natural gas prices rose 2.9% on the back of low inventories ahead of the winter season. 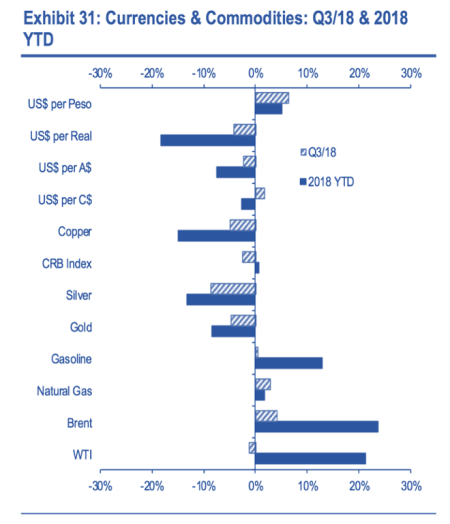 YTD, oil is the top-performing commodity, with both Brent and WTI prices up 21% and 24%, respectively, but retreating metal prices (copper -15%, gold -8.5%) leaves the CRB index flattish (+0.7%, +3.4% in C$ terms). With inflation pressures building and monetary policy normalization expected to continue, Canadian and US bond yields moved higher. In the US, 10-year yields climbed 20 bp in Q3 to 3.06%, while 2-year yields rose even more (+29 bp), leading to a flattening of the curve. In Canada, 10-year yields increased 26bp to 2.43%. 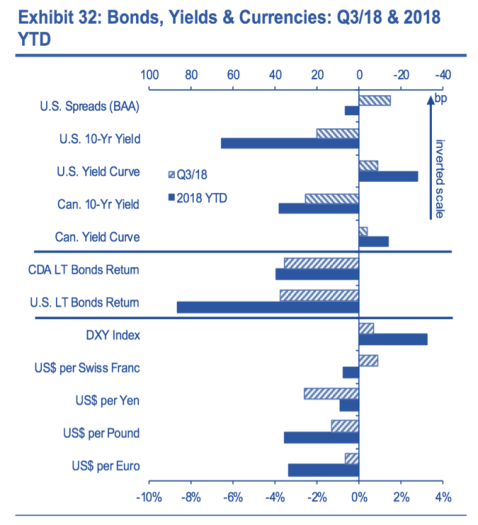 The upswing in yields pushed both CDA and US long term bond returns into negative territory last quarter. Hence, the Canadian FTSE TMX Universe Bond index retreated 1.0% (TR) in Q3/18 and underperformed the TSX Composite (-0.6%) by 39bp, but cash was king with a 0.3% gain. In the US, the S&P 500 (+7.7% TR) easily beat the U.S. Aggregate Bond Index (+0.0%) in Q3. Since the start of the year, the TSX (+1.4%) is a bit ahead of cash (+0.9%) and bonds (-0.4%). Still, the S&P 500 (+11%) is beating US bonds (-1.6%) by a much wider margin. Investors suffered an uncomfortable sensation last week when global markets performed a rare swan dive that stirred fears that the long, post crisis bull run could be coming to an end. The dawning realization that the US economy’s strength gives the Federal Reverse cover to keep raising interest rates triggered a ferocious bond sell off at the start of October. That weighed on stocks, but it wasn’t until last week that equity investors really started to react to the implication of higher treasury yields. Investors are likely to have to learn these bouts of turbulence. While analysts and investors disagree on the near-term outlook, most agree the post crisis economic expansion is closer to its end than its beginning. We believe trade concerns, rising rates, higher inflation will continue to add volatility to the markets. We also believe global growth is not in trouble yet, earnings momentum remains in the U.S. and we don’t see any indicators pointing to a recession yet. We believe a balanced portfolio still offers a compelling risk-reward profile and will look at any equity pullback as an opportunity to add further risk assets. 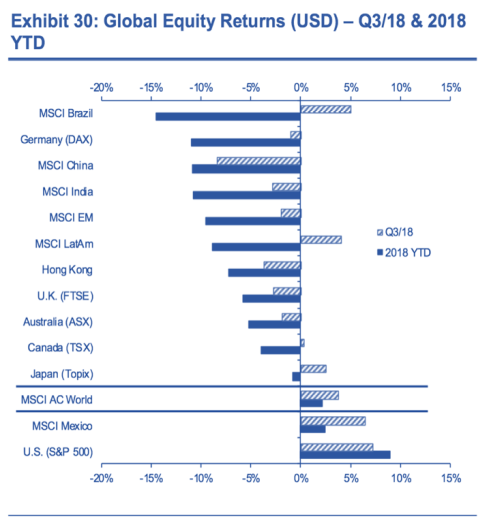 During the quarter, the Holdun Canadian Equity lost 1.1% (total return in local currency) and on a relative basis, the portfolio underperformed the S&P TSX by about 0.5%. Stock selection was a value add while sector allocation negatively impacted our relative performance. The U.S. Equity market gained 7.7% (total return), during the quarter while the Holdun U.S. Equity gained 8.8% and outperformed its benchmark by 1.1%. Returns in the quarter were led by Healthcare which gained 16% and industrial which gained 15%. Sector allocation was a value add within the U.S. portfolio. 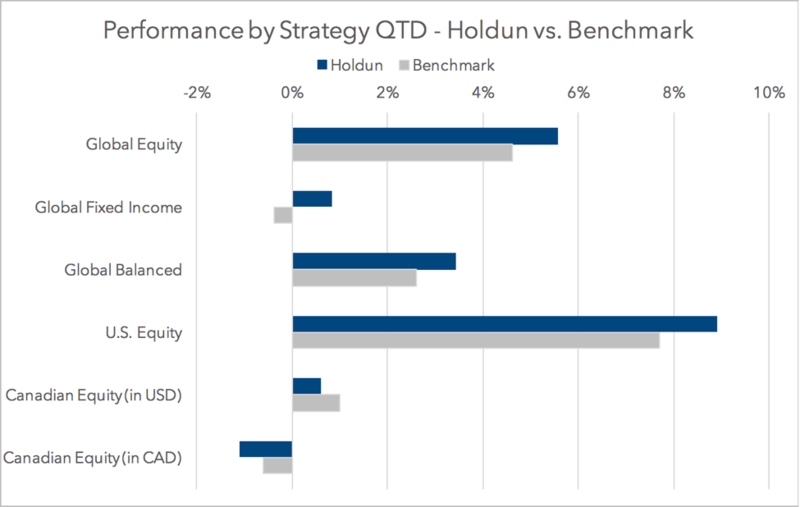 The Holdun Global Equity strategy gained 5.6% during the quarter, outperforming its benchmark by 1%.